Random flagship is such a good mod. Possibly criminally underrated. Download and extract the Flagship Randomizer .zip file. WIndows: Execute the .exe file. superarmandbros wrote: 2.1. Open Terminal and type cd then hit space. 2.2. Drag and drop the Flagship Randomiser folder into Terminal then press Enter. Linux: Give the .sh file permission to be executed as a a program and execute it. "AE": A randomized Flagship that uses mostly assets from vanilla FTL and Advanced Edition. "ACE": A randomized Flagship that also uses CE style assets. Requires Captain's Edition to be installed. "ACE-INF": A harsher Flagship seed for CE Infinite. Requires Captain's Edition to be installed. Hit the "Build Random Flagship" button. The tool will generate a "Random Flagship" mod in the designated output directory. Install this mod as usual with Slipstream Mod Manager. The mod is fully compatible with AE and CE, depending on which build option you choose. AE flagship builds will not work with CE and vice versa. CE flagships will require CE to work. The mod is best placed after any other mods you might be using. Generate another Randomized Flagship mod whenever you want to randomize the flagship again. -Update to random generation tool (output file name can be configured by changing the value of the attribute outputName in the assetList.xml file). -1st augment is now based on the type of random system generated, and will be described as an attribute of the system at the starting event. -Added fix to 3rd phase event text. -Added support for multiple predicate keys for each asset. -Weapon selection now limited to no more then 2 Non Hull Damaging weapons. -Weapon selection now limited to no more then 1 unique weapon (arti laser, since it has extremly limited shield breaking abilities). -Augment offensive selection updated - removed auto loader, added explosive replicator and zoltan bypass. 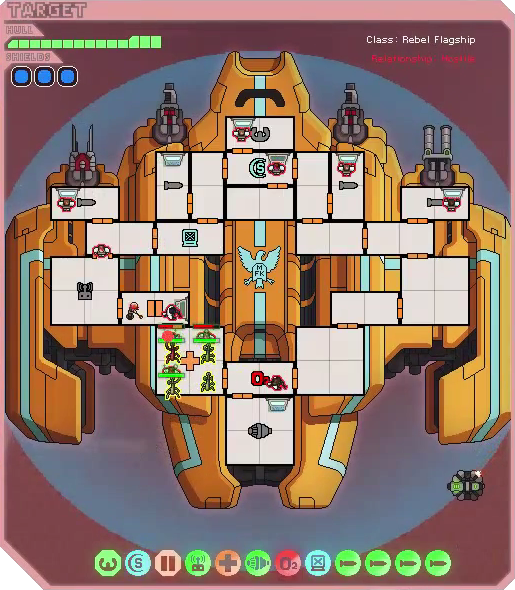 The Flagship Randomizer is a small program that randomizes the flagship by combining a huge amount of different layouts, systems, weapons, drones and augments. It can create a large range of unique boss fights for FTL. Do you consider yourself an experienced FTL player? 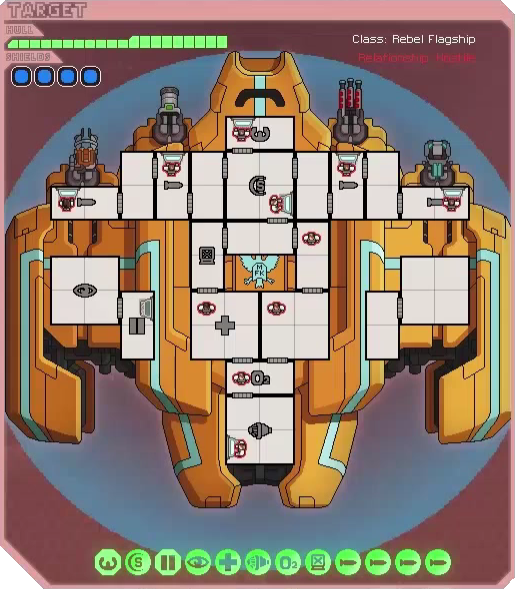 Have you beaten the flagship so often that the fight has become almost trivial for you? Are you looking for a new challenge? Then the Flagship Randomizer might be something for you. The Flagship Randomizer is not a mod itself. It is a tool that creates a mod for you. We can not randomize the flagship ingame, so rann coded a program that pieces together a large amount of possible boss components to create a randomized boss. The program then creates a ready to use Random Flagship .ftl file, which can be installed like any other mod. 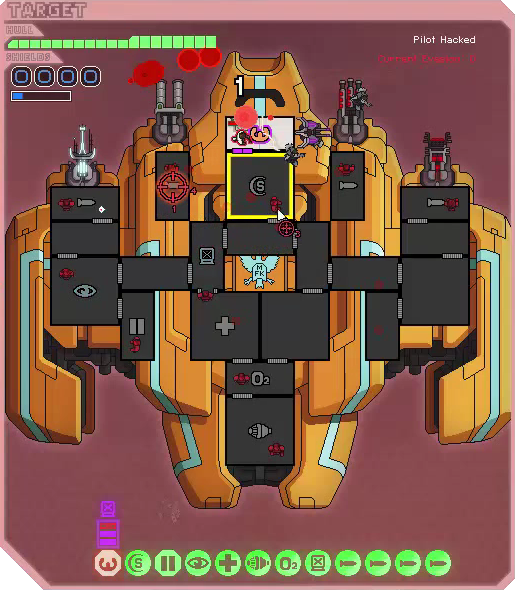 If you want the Flagship to be truly random you might want to create a new Random Flagship mod for each run you play. What is the difference between the various builds that can be selected? Selecting "AE" in the tool will generate a randomized flagship that only uses vanilla style weaponry. Turning AE on is kind of required for this to work. The "ACE" option will generate a randomized Flagship that requires FTL Captain's Edition to be installed. ACE flagships can have many additional CE-style boss weapons and also use other CE assets. "ACE-INF" flagships will be slightly more aggressive and overall stronger to provide an ample endgame challenge for CE Infinite runs. How difficult will the fight be? Is it harder or easier than vanilla? Stuff the tool randomizes includes the flagships layouts, its weapons and which systems it has available in each phase. The vanilla assets are still part of the mix as well, but won't be prevalent. The addition of a single set of augs for all phases is an outright buff for the boss and some room layouts are also stronger than the original. Most possible boss weapons have about the same DPS as vanilla originals of the same weapon type. Their firing cycles are largely unchanged. Still, the weapons do different things and can have completely new synergies. Overall the boss is going to be harder, although occasionally it might also have stronger weak points. How can I even beat a randomized boss? Having to face a completely random boss with the mod is not as daunting as it sounds, because the Random Flagship mod won't leave you completely in the dark. At the beginning of the game you will get a chance to look at the secret data you are carrying, giving you information on the flagships layout, weapons, equipment and so on. This creates a unique meta-mission for each randomized flagship playthrough. You'll know what your random flagship will throw at you during this particular run and, as in vanilla, you can try try to prepare for it. The program also has some safeguards that will prevent it from creating extremely strong (or weak) flagships, so you'll never have to face a boss with four missile launchers and a defense scrambler, or similar monstrosities. Thats it for now. Big thanks to rannl who initialized this project and did most of the work. I recommend you all check out his ship radomizers as well. They take the concept of externally randomizing FTLs content to a whole new level. Have fun with your randomized flagship battles. Last edited by Sleeper Service on Wed Nov 19, 2014 11:03 am, edited 39 times in total. Thank you again for actually making this happen guys!!! Big thanks to rannl! I knew only he could make this happen. Question: what if I install this mod midway through a playthrough? I'm in sector 6ish-level deepspace. Will I be able to see what the Flagship has? Will it mess up the playthrough? without any indents. Is that bad? Last edited by NarnKar on Mon Sep 01, 2014 5:03 pm, edited 1 time in total. I can guarantee it but I pretty sure this will actually work. Maybe backup your save before you go to the final sector? You won't get to know what the flagship will have in store though. Might not be a big problem if you max out in deep space before going to the fight. You could also just extract the mod and read what is in events.xml.append. Edited my above post. I think the weapon blueprints are generated incorrectly? A big thank you for Sleepy who made the tool possible. Your the Captain of Captain's edition. Don't worry about the identation NarnKar, it isn't an issue XML-wise. Russian Rockman wrote: Thank you again for actually making this happen guys!! !